Artist contains "William Eduard Scott"
William Eduardo Scott completed this mural in 1943. 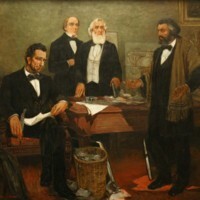 The mural depicts a historical meeting during which the abolitionist Frederick Douglass advised President Lincoln to enlist black soldiers into the Union Army during the Civil War. A national competition was held for this mural commission, part of a series installed in the Recorder of the Deeds Building in Washington D.C. Artists were asked to depict episodes from African American history. Out of 300 applicants, seven were selected. Scott was the only African American artist. The subjects of the other panels were Crispus Attucks, Benjamin Banneker, the death of Colonel Shaw at Fort Wagner, slaves building bulwarks from cotton bales at the Battle of New Orleans, Cyrus Tiffany saving Commodore Perry’s life at the Battle of Lake Erie, and Matthew Henson planting the American flag at the North Pole.